The Cook Islands Football Association is pleased to announce former New Zealand national team coach Kevin Fallon as the new coach for the national men’s team. Fallon is no stranger to the Cook Islands having conducted football programs on the islands of Aitutaki, Mauke, and Mitiaro among others, for both FIFA and OFC. Fallon is already underway in his new role, conducting two training sessions with local players on 4-5 September at the CIFA Complex. “I will say this, after even one session last night it’s definitely improved. I mean I saw people doing things and looking at technique, that was better technique than say 15-20 years ago so that was encouraging and that was just the local lads,” Fallon said following the sessions. The former All Whites coach is pleased to be back in the Cook Islands and comes with a plan to identify and select high quality players which will give the national team a more competitive edge. “The plan is obviously to get recognition of what the squad is inside the Cook Islands and then contact the people outside country and try and get it in mind a working squad for later on,” Fallon explained of his process. “We have got to identify which players want to play for the national team and which players are good enough – simple as that. 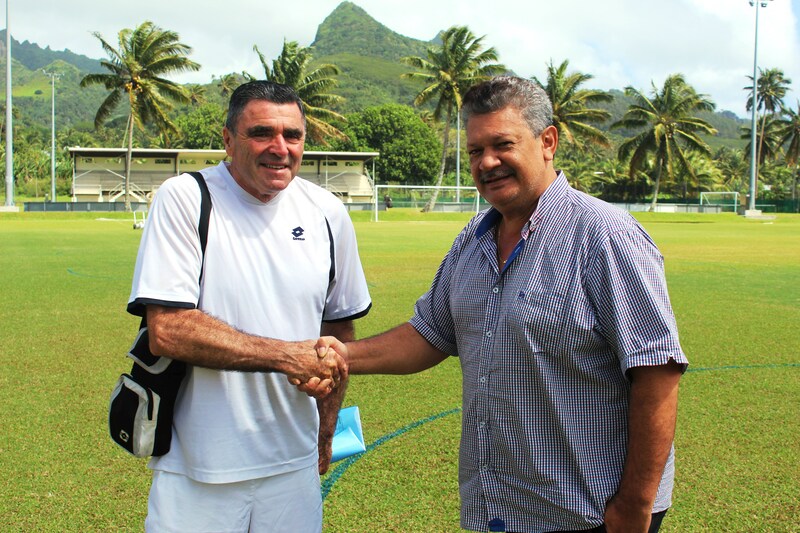 Fallon is contracted to the role of Cook Islands national men’s team coach for two years.